Thank you so much to all the linker uppers last month! Apologies for running a bit late this month. The end of term and start of the school summer holidays have made their impact on my time to blog! I suspect many of you will be in a similar boat!? Talking of holidays, last month Rainbows Are Too Beautiful shared an absolutely lovely little movie by @bobscartoons in her regular Wonderful Wednesday feature. Family holidays can be daunting at the best of times, but when you have access and sensory considerations to make too, it can become a mission and a half! There were also a number of posts on inclusion last time. Both good and bad examples! Rainbows are Too Beautiful writes a lovely message to say Thank You Little Girls after glimpsing some natural moments of acceptance and inclusion between her little boy and his classmates at his school assembly. And finally, my fantastic campaigner friend Lorna has decided to dabble in the world of blogging! Her first post about changing places toilets Even our Hospital Doesn’t Have a Toilet That We Can Safely Use was published in the #HPEveryBody series on HuffPost UK! Please read and sign her petition for #ChangingPlaces Toilets at the end of the post! I hope you’ll check in again next month to catch up with the blog posts in the round up, and bloggers I hope to see lots of you again this month and *meet* some new people too! I’ve switched over to Inlinkz for the linky this month as I think it’s a bit more user friendly, hope you think so too! The linky will be open for 2 weeks, please do share your posts about ideas and experiences (good and bad!) around physical and/or sensory accessibility of buildings, places, spaces, products and/or activities below…. And do check in again next month to read the round up! Please comment on this post to introduce yourself if you’re new to the linky, and comment on some of the other linked posts to help share ideas and experiences (use the hashtag #AccessLinky in your comment)! It would also be amazing if you could share your post (using the hashtag #AccessLinky) on social media to help spread awareness of the issues around accessibility! I’ll also try to retweet as many posts as I can! I welcome input from anyone that is affected by accessible design – users, carers, friends and family as well as designers, developers, managers and legislators (so pretty much everyone then!). I welome blogs from professionals and suppliers as well as individual bloggers as long as they keep within the spirit of idea exchange and are not sales posts for products or services. Hello I’m Gemma, I’m a wheelchair user and have SMA. I’m a blogger at https://wheelescapades.wordpress.com I blog about my life with wheels. I’m following you on twitter and enjoying the read. Architect blogger and mum carer. I'm passionate about #InclusiveDesign and sustainability, and am mostly talking about home adaptations and accessible places, spaces and things. 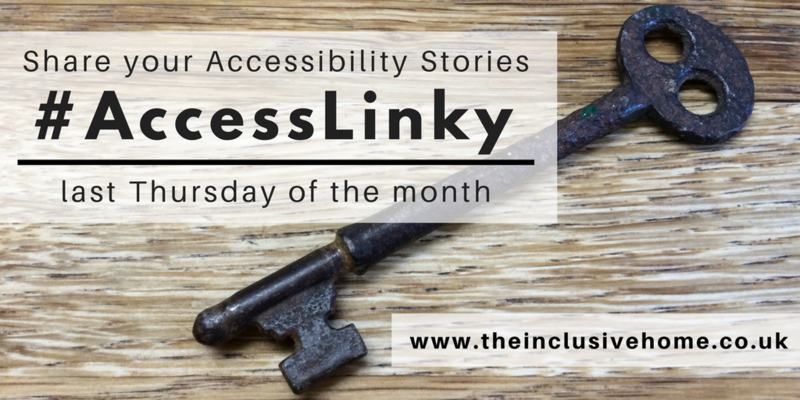 Link up your accessibility stories (physical, sensory or social) to my #accesslinky! Opens on the last Thursday in the month.